An updated take on the classic living room armchair, this striking grey piece makes a great addition to any home from cozy mountain lodge to luxury city loft. 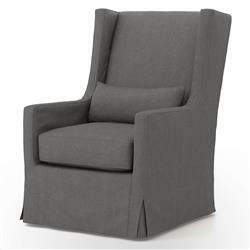 Modern lines and proportions bring a contemporary, graphic flair to the wingback design. A charcoal grey, linen slip cover gives a sleek yet homey feel to the swivel chair and allows for easy upkeep and cleaning.